As one of the most recognizable names in American art, just the mention of Georgia OKeeffe immediately brings to mind her innovative style. Her presentation of the world she sees in large magnified images, O’Keeffe’s still life paintings of flowers are her most recognizable works. While living in New York brought her fame, escaping to the Southwest gave her freedom and happiness. O’Keeffe first discovered New Mexico on her way to Texas in 1916. When she returned in 1929, she became convinced it was a place she wanted to explore and paint. She began spending part of the year discovering the area and painting its vistas. She painted the landscape that had captured her imagination, but it was her still life paintings of flowers, bones, rocks, trees, churches, and her adobe home that provide the most vivid picture of the essence of the Southwest. Georgia O’Keeffe’s Mule’s Skull with Pink Poinsettia combines the artist’s favorite New Mexico still life themes of flowers and animal skulls to produce a composition evocative of the Southwest. 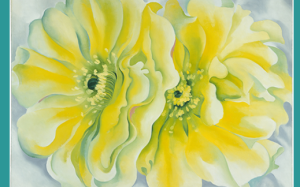 In Yellow Cactus Flower, Georgia O’Keeffe uses her enlarged and magnified approach to floral still life painting to give an up-close view of a flower that symbolizes her beloved New Mexico. Gustave Baumann focuses on Native America culture in Hopi Katzinas, a group of spiritual dancing figures, one of his favorite subjects for his Southwestern prints. Raymond Johnson’s Santo (Saint Michael) reflects Hispanic cultural tradition of uses images of saints for devotional purposes in their Southwestern homes. The ancient land and rich cultural traditions of the Southwest region of the United States fueled the imaginations of early 20th century artists like Georgia O’Keeffe. The evocative still life paintings produced by these artists helped attract audiences to visit the Southwest and, still today, provide a fascinating example of art’s capacity to document the essence of a place and time. Georgia O’Keeffe and the Southwestern Still Life tells the story of the Southwest as seen through the eyes of the artists who lived there. Focusing on still lifes – representations of an object or groups of objects – the exhibition features more than 50 works that provide fascinating examples of art’s capacity to capture the essence of a particular place.